We are the Manufactuers of Paddle Mixers. The Paddle Mixer Machines offered by us are used for mixing dry or dump materials and used for tablet granulation. 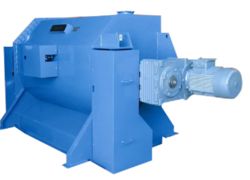 Manufactured from high grade metal and alloys, these machines are known for their sturdy construction, application specific design and long working life. Easy to maintain, these machines are also provided by us as per the specifications provided by the clients. We offer our clients, Single Shaft Paddle Mixer that has unitized steel frame construction to minimize vibration as well as wear on the machine and support structure mixer. In this, tub walls are in cylindrical shape for easy, energy saving and tumbling action to provide top quality mix as well as the batch uniformity. We design and develop a precision engineered range of concrete mixers which is customized as per the specifications of our clients. These mixers are widely used in the construction industry and have enabled us to carve a niche in the market. Our range is acknowledged for its features such as easy operation, corrosion resistance, perfect mixing ability and durability. 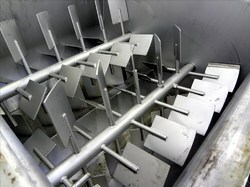 Paddle Batch Mixers designed for wet or dry blending applications. Banking on the skills of our qualified team of professionals, we are involved in providing Paddle Mixer to our customers.